I do not eat out a lot… but when I do… I like to check out the loo. Because the loo is the window to the food-safe savvy of the place. If the john is filthy, I can only imagine the microbial army that is massing for another attack on the kitchen tiles. So… when I was at a local Victoria Greek deli (there are a few in town), I was horrified to run to the lav for an pre-victual ablution. Only to find… the dreaded continuous roll recycling cloth towel thing. And I thought to myself – have I entered a bathroom time tunnel? 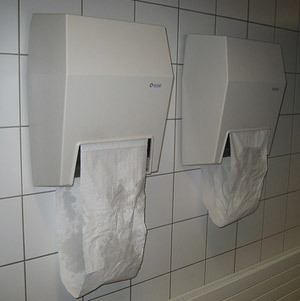 Do people actually still service and install these germ dispensers? Does this same time paradigm also hold all you can eat buffets without sneeze guards? Or self serve bakeries without tongs? Yeah – I can name a few of those in my Universe. Folks. I would rather rinse my hair in a public toilet bowl than dry my hands on one of these disease treadmills. And yet here it was… in one of my formerly favorite Greek joints. It makes me go Ewwwwwwwwww. How about you? Well since you put it that way, ya it is kinda gross.